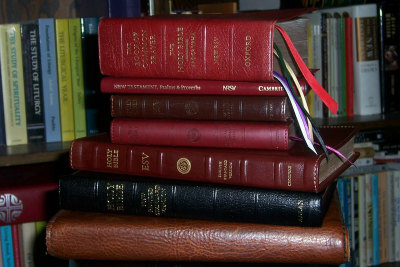 I've attached a picture of the Bibles purchased under your influence. From the bottom up: -- Cambridge NRSV Wide Margin in "Renaissance Faire" leather cover since it gets hard use -- Allan Goatskin NRSV -- ESV Cordovan Calfskin Classic Thinline -- Two ESV Portfolio Thinlines, one for Vanessa's work and a well-worn one for the car and various pastoral duties -- Cambridge NRSV New Testament, Psalms, and Proverbs -- Oxford Book of Common Prayer/NRSV combo in Calfskin Although the book at the top of the stack was purchased long before running across your blog, it's clearly in the spirit of your writing. The leather cover on the wide margin comes from Renaissance Art. It occurs to me that your Bible Design Blog is like the tree of the knowledge of good and evil. I eat from tree and see that my Bible shelves are naked. Thanks, Mark, for sharing the collection. I can't help feeling a little like the serpent in the garden, but it's all in a good cause! (Plus, you're the one tempting me with that red one on top, and the Allan NRSV!) Consider this a warning, everyone. Prolonged exposure to this site can put a strain on your pocketbook and your bookshelves. Proceed with caution!